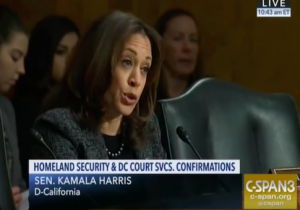 At a Thursday confirmation hearing for President Donald Trump's nominee to head Immigrations and Customs Enforcement, Sen. Kamala Harris (D., Calif.) compared the agency to the Ku Klux Klan. Harris asked Trump's nominee for the position, Ronald Vitiello, about comments he previously made in which he referred to the Democratic Party as "neo-Klan" like. Vitiello apologized for the comments, calling them inappropriate because of the Klan's history. Harris asked him to expound on why the comments were inappropriate. "Because they tried to use fear and force to change the political environment," Vitiello replied. "And what was the motivation for the use of fear and force?" Harris asked. "Based on race and ethnicity, " Vitiello responded. "Right," Harris responded. "And are you aware of the perception of many about how the power and discretion at ICE is being used to enforce the law and do you see any parallels?" "I do not see any parallels," Vitiello responded, prompting Harris to say she was talking about perceptions. "There's a lot of perceptions in the media and in the public that are incorrect about the agency," Vitiello said. In his opening statement for the hearing, Vitiello said,"If confirmed, one of my highest priorities will be to better demonstrate to the public, Congress, and the media the importance of our mission to homeland security and public safety — and why our agency’s existence should not be up for debate." Several Democrats, including Congresswoman-elect Alexandria Ocasio-Cortez (D., N.Y.) and potential 2020 candidates Sens. Kirsten Gillibrand (D., N.Y.) and Elizabeth Warren (D., Mass.) have called for ICE to be abolished. Harris herself questioned ICE's role in a June 2018 interview and said the government may need to "start from scratch" when it comes to immigration enforcement. "There’s no question that we’ve got to critically reexamine ICE and its role, and the way that it is being administered, and the work it is doing. And we need to probably think about starting from scratch," she told NBC's "Meet the Press." Republican National Committee Chairwoman Ronna McDaniel responded to Harris's comments. "Kamala Harris is trying to launch her 2020 campaign off of comparing ICE officers to the KKK, and it's absolutely disgusting," McDaniel wrote in a tweet. UPDATE 1:51 pm: Post was updated to include comment from RNC chairwoman Ronna McDaniel.